Join us for Bingo every week! 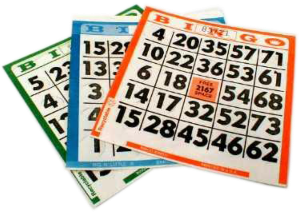 The numbers in the columns of a Bingo ticket are selected at random and printed according to the range - numbers in the B column are from 1 to 15, in the I column between 16 and 30, in the N column (that contains four numbers and the free (blank) space) between 31 and 45, in the G column between 46 and 60, and in the O column between 61 and 75. Players are provided with series of unique cards, that sometimes count 4,000 or 6,000. Some manufacturers produce cards with a series number that means that the cards with the same series number will have the same numbers in the same places.